Not to be confused with Hatfield Manor House. For other uses, see Hatfield House (disambiguation). 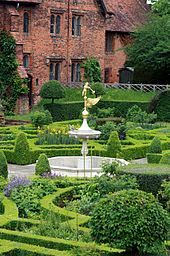 Hatfield House is a country house set in a large park, the Great Park, on the eastern side of the town of Hatfield, Hertfordshire, England. The present Jacobean house, a leading example of the prodigy house, was built in 1611 by Robert Cecil, 1st Earl of Salisbury and Chief Minister to King James I and has been the home of the Cecil family ever since. It is a prime example of Jacobean architecture. The estate includes extensive grounds and surviving parts of an earlier palace. The house, currently the home of Robert Gascoyne-Cecil, 7th Marquess of Salisbury, is open to the public. An earlier building on the site was the Royal Palace of Hatfield. Only part of this still exists, a short distance from the present house. That palace was the childhood home and favourite residence of Queen Elizabeth I. Built in 1497 by the Bishop of Ely, King Henry VII's minister John Cardinal Morton, it comprised four wings in a square surrounding a central courtyard. The palace was seized by Henry VIII with other church properties. The nearby parish church of St Etheldreda's, in Old Hatfield once served the Bishops Palace as well as the village. Close view of Hatfield House Old Palace, showing Tudor brickwork. 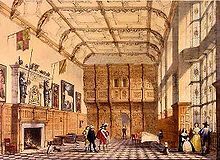 Henry VIII's children, King Edward VI and the future Queen Elizabeth I, spent their youth at Hatfield Palace. His eldest daughter, who later reigned as Queen Mary I, lived there between 1533 and 1536, when she was sent to wait on the then Princess Elizabeth, as punishment for refusing to recognise Henry's marriage to Anne Boleyn and his religious reforms. In 1548, when she was only 15 years old, Elizabeth was under suspicion of having illegally agreed to marry Thomas Seymour, the House and her servants were seized by Edward VI's agent Robert Tyrwhit, and she was interrogated there. She successfully defended her conduct with wit and defiance. Seymour was executed in 1549 for numerous other crimes against the crown. After her two months of imprisonment in the Tower of London by her sister Queen Mary, Elizabeth returned to Hatfield. The Queen Elizabeth Oak on the grounds of the estate is said to be the location where Elizabeth was told she was Queen following Mary's death, but is considered unlikely as Mary died in November. In November 1558, Elizabeth held her first Council of State in the Great Hall. Hatfield House is a popular tourist attraction because it has so many objects associated with Queen Elizabeth I, including some gloves and a pair of silk stockings that are believed to have been the first ones in England. The library displays a 22-foot (6.7 m) long illuminated parchment roll showing the pedigree of the Queen with ancestors back to Adam and Eve. The Marble Hall holds the "Rainbow Portrait" of Elizabeth. Elizabeth's successor, King James I, did not like the palace much and so gave it to Elizabeth's (and his own) chief minister Robert Cecil, 1st Earl of Salisbury in 1607, in exchange for Theobalds Palace which was the Cecils' family home on the current site of Cedars Park, Broxbourne. Cecil, who liked building, tore down three wings of the royal palace (the back and sides of the square) in 1608 and used the bricks to build the present structure. The richly carved wooden Grand Staircase and the rare stained glass window in the private chapel are among the house's original Jacobean features. Cecil's descendant, Robert Arthur Talbot Gascoyne-Cecil, 3rd Marquess of Salisbury, was three times prime minister during the closing years of Queen Victoria's reign. The city of Salisbury, Rhodesia (now Harare, Zimbabwe) was founded in his time, and named for him. He is also known for often putting members of his family into the Government while Prime Minister. As his first name was Robert, this habit is sometimes said to have given rise to the popular expression 'Bob's your uncle' (meaning roughly 'It's all right, everything is sure to come off'). During World War II, Hatfield house was the location of the first Civil Resettlement Unit, and acted as Headquarters for the scheme. CRUs were created to help repatriated British prisoners of war to transition back to civilian life, and the luxurious setting of Hatfield was considered very beneficial to these men. On 12 July 1945, the King and Queen visited the CRU at Hatfield, which generated significant news coverage. The Gardens, covering 42 acres (170,000 m2), date from the early 17th century, and were laid out by John Tradescant the elder. Tradescant visited Europe and brought back trees and plants that had never previously been grown in England. The gardens included orchards, fountains, scented plants, water parterres, terraces, herb gardens and a foot maze. They were neglected in the 18th century, but restoration began in Victorian times and continues under the present Dowager Marchioness of Salisbury. During World War I, the grounds were used to test the first British tanks. An area was dug with trenches and craters and covered with barbed-wire to represent no man's land and German trench lines on the Western Front. To commemorate this, the only surviving Mark I tank was sited at Hatfield from 1919 until 1970 before being moved to The Tank Museum, Bovington. The Rhodesian Light Infantry Regimental Association has placed its 'Troopie' memorial statue on the grounds of Hatfield House, due to the long association of the Cecil family with Southern Rhodesia. Around its base is a roll of regimental members ('troopies') who fell in the Rhodesian Bush War and several inscriptions, including 'In reconciliation and hope for future peace in Zimbabwe'. The State Rooms can be seen in the midweek guided tours, and visitors can look around in their own time at weekends. On Friday, the Garden Connoisseur's Day, the House is open for guided tours and for pre-booked specialist groups. There are five miles of marked trails. The hall and staircase were used in 1984 film Greystoke: The Legend of Tarzan, Lord of the Apes. Portions of the house and exterior were used in the 1992 film Orlando, starring Tilda Swinton as Orlando, Billy Zane as Marmaduke Bonthrop Shelmerdine and Quentin Crisp as Queen Elizabeth. Many interior scenes of the Wayne Manor in the 1989 film Batman and the 1992 sequel Batman Returns were shot at Hatfield House. The outside scenes of the two Lara Croft films with Angelina Jolie were shot at Hatfield House, which serves as her home in the film. Subsequently, the outside of Lara's mansion in the video game Tomb Raider: Underworld is based on Hatfield House. In Lara Croft Tomb Raider: The Cradle of Life, The Long Gallery and the Library of the house were used for filming the scene where the MI6 agents meet Lara and give her a task to retrieve Pandora's Box. The Bo Ken self-defense practice scene was filmed in the entrance hall of the house. Also, AL9 5NQ appears as the postal code on many letters in Rise of the Tomb Raider. It appears in the 2005 film The New World with Colin Farrell. Hatfield House was used to portray Chartley Hall, where Mary, Queen of Scots, played by Samantha Morton, was kept captive before her execution, in the 2007 film Elizabeth: The Golden Age. The white frontage of the south facing view of Hatfield House was used in the 1998 film Shakespeare in Love as a location in Greenwich. Hatfield House was featured as "Chimneys" in the 2010 Agatha Christie's Marple adaptation of Agatha Christie's The Secret of Chimneys. Hatfield House appeared several times throughout the television film Dustbin Baby as the manor to which Marion takes April, and as the manor where Marion and Elliot work. The Long Gallery was used in the 2009 film Sherlock Holmes. Russell Brand filmed at the house in August 2009, for the 2010 film Get Him to the Greek. In July 2010, an episode of Antiques Roadshow was filmed at Hatfield House. In 2010, MasterChef Australia filmed the contestants cooking for Heston Blumenthal in Hatfield House. It featured in a November episode of Alan Titchmarsh's Garden Secrets, which studied the house's 17th century formal Garden. In March 2011, Hatfield House featured as part of the 20 episode long series of the BBC's Royal Upstairs Downstairs which followed the royal tour of Queen Victoria in 1846 who visited the home. In the 2011 film My Week with Marilyn starring Michelle Williams, Kenneth Branagh and Eddie Redmayne, internal scenes represented as Windsor Castle were filmed in Hatfield House, whilst the Broad Water (where the River Lea flows through Hatfield Park) was used in a skinny dipping scene. In the 2016 film Pride and Prejudice and Zombies, Hatfield House is used as Rosings Park, where Lady Catherine de Bourgh lives. It was used for filming of the 2017 film All the Money in the World and the TV series Trust, both based on the 1973 kidnapping of John Paul Getty III, the grandson of oil tycoon J. Paul Getty, who at the time lived in the 16th century Tudor manor Sutton Place. Hatfield is featured extensively in The Favourite (2018), acting as Anne, Queen of Great Britain's home. The Hatfield House and its gardens were the filming location of the Jonas Brothers reunion music video for their single, “Sucker” released March 1st, 2019. Other films include Cromwell with Alec Guinness (west side of the house), Henry VIII and His Six Wives with Keith Michell, Charlotte Rampling and Lynne Frederick (the Old Palace and park), The Avengers (with Sean Connery overlooking the maze), Charlie and the Chocolate Factory starring Johnny Depp, V for Vendetta with Stephen Fry and Mortdecai in 2015 starring Johnny Depp and Gwyneth Paltrow. ^ White, Alice (2016). "Chapter Five: Settling down in Civvy Street". From the Science of Selection to Psychologising Civvy Street: The Tavistock Group, 1939-1948 (Thesis). University of Kent. ^ "The King and Queen with Ex-Prisoners: Visit to Civil Resettlement Unit". The Yorkshire Post and Leeds Mercury. 13 July 1945. ^ "Resettling War Prisoners: Aids to Civil Life: The King and Queen at Hatfield". The Times. 13 July 1945. CS69681389 – via Gale. ^ "Army's Civil Resettlement: King and Queen Visit Hatfield House Centre". The Manchester Guardian. 13 July 1945 – via Proquest. ^ a b c d e f g h i "Filming". Hatfield House. 2010. Archived from the original on 4 October 2010. Retrieved 4 October 2010. ^ "BBC One's Antiques Roadshow here this summer". Hatfield House. 5 May 2010. Archived from the original on 4 October 2010. Retrieved 4 October 2010. ^ Masterchef Australia, Television New Zealand website. Retrieved on 27 October 2011. ^ "Alan Tichmarsh's Garden Secrets". BBC. 8 November 2010. Archived from the original on 9 November 2010. Retrieved 8 November 2010. ^ Malkin, Marc (2 April 2018). "Here's How FX's New Series Trust Replicated the Sutton Place Estate of John Paul Getty III". Architectural Digest. Retrieved 6 April 2018. Cecil, Lord David. The Cecils of Hatfield House: An English Ruling Family. Houghton Mifflin, 1973. Wikimedia Commons has media related to Hatfield House. This page was last edited on 25 March 2019, at 19:46 (UTC).